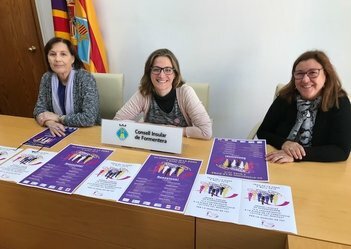 Social welfare secretary Vanessa Parellada sat down this morning with one of the administration's equality specialists, Azuzena Carrasco, and Espai Dones chairwoman Dolores Fernández Tamargo to unveil the activities programme for next Thursday, March 8, International Women's Day. A multifarious spread of activities —with each one, at the centre, women— began last Thursday on the Dia de les Illes Balears (Day of the Balearic Islands). Celebrations will conclude April 16. The programme continues this Monday at 8.00pm with the opening of an exhibition by Maria Arjona. The title, “Dones amb massa coses al cap”, translates roughly as “Women with too much on their mind”, and is on display until next Saturday, April 17. Next Thurday a whole series of activities and events are lined up to celebrate International Women's Day. To start, there will be informational stand from 11.00am in plaça de la Constitució in Sant Francesc. After that, the day's programme kicks off with a 12-noon rendezvous in the square ahead of a 12.15pm reading of the day's manifesto. High turnout is expected, not least because unions have called a strike to combat discrimination of women, in all of its forms—professional, economic, social. The Formentera Council will participate as well. At 5.00p.m. in the Sant Ferran library, Maritza Caballero will be on hand to lead a family-friendly storytelling session, “Cuentos para valientes” focussing on equality. Organisers are also planning a 7.30pm screening of “Excluidas del Paraiso” with discussion to follow in the Office of Culture's Sala d'Actes. Expect a dose of cinema, too. On Friday the 9th and Sunday the 11th, a Spanish-language version of Hidden Figures (Figuras Ocultas, in Castilian) will be shown in the island's cinema. At 4.30pm on Friday the 16th, organisers are teeing up an initiation to batucada drum gatherings, and Saturday the 17th will holds an International Women's Day tradition, the sopar de germanor (“supper for sisterhood”). Seven p.m. on Monday the 19th, Victòria Alemany will lead a workshop entitled Mindfulness for Wellbeing in the Sala d'Actes and, Thursday the 22nd, island youth meeting point, the Casal de Joves, will host a storytelling session with Encarna de las Heras. At noon on Sunday the 25th, Formentera's dependent care centre will be the site of the tenth Homenatge a la Dona major (“Tribute to the elderly woman of Formentera”). Celebrations come to an official close on Monday, April 16, at 8.00pm in the Marià Villangómez library. There, writer Núria Varela, who holds a masters in policymaking on equality between women and men, will talk about gender equality and her latest book “Feminismo para principiantes”.